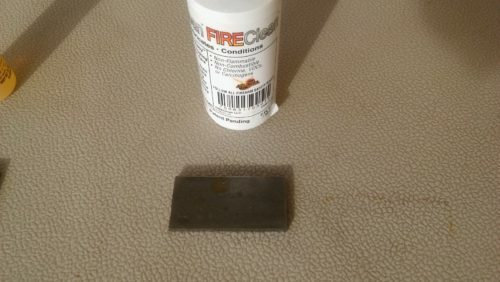 Fireclean CLP is a non-toxic cleaner, lubricant and protectant. I have used it in the past on a AK-47 and it performed well as a lubricant. Let’s test its ability to protect metal from corrosion. 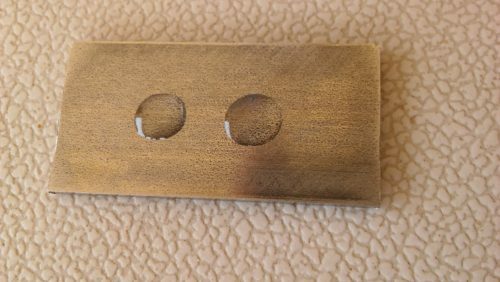 I use a simple gun oil corrosion test consisting of a bare metal plate, gun oil or CLP, gun cleaner, cleaning patches and a water spray bottle. I clean the metal plate and then apply the gun oil or CLP. The treated metal plate is then subject to the Arizona desert conditions in addition to water spray every other day. 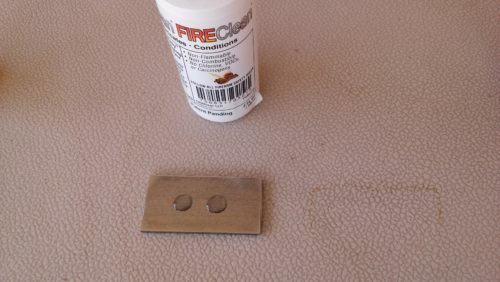 Here’s the Fireclean CLP and bare metal plate. 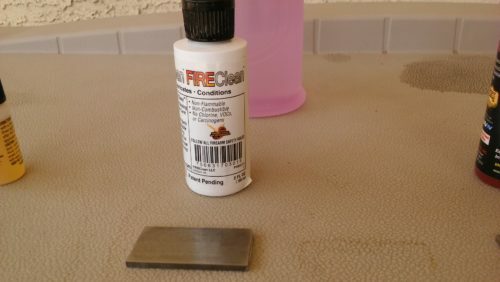 I applied 2 drops of Fireclean CLP to the clean bare metal plate. I will spread the 2 drops out evenly with a few cleaning patches. The Fireclean actually removed a tiny amount of dirt when I spread it out with the cleaning patches. Now lets spray some water on it and start the test. The water beaded very nicely. Now let’s let it sit and see what happens. Here are the results after 24 hours of the desert climate and 1 water spray. 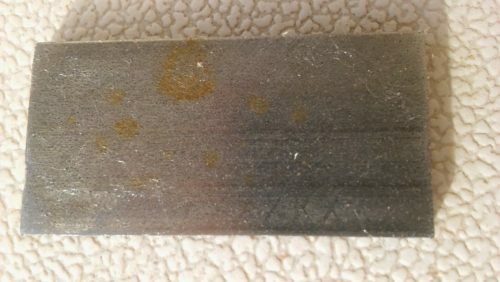 There is some rust on the metal. Let’s take a closer look. Now you can see the light rust on the metal. 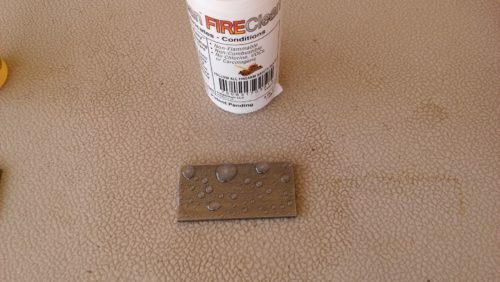 Fireclean CLP did not prevent corrosion when water was introduced and the Arizona desert heat. 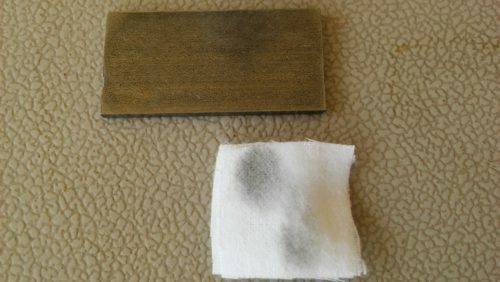 Here are 3 ways you can prevent rust on guns, tools or whatever. So what’s the best gun oil for long term storage? If you’re planning on putting guns into storage for months or years, you’ll need to protect the metal from corrosion. If you look back in history, you’ll find that Cosmoline was used to protect military arms while in long term storage (years). It works really well but it is heavy like a grease. Grease is most likely the very best product for long term metal storage. Grease is heavy and stays put and will provide years of protection indoors and outdoors. Cosmoline has protected some small arms for over 50 years. It’s a great product. Cosmoline is a military grade corrosion preventative that is used on small arms, machinery, military vehicles, etc. You spray it on any metal or wood surface. That’s it! 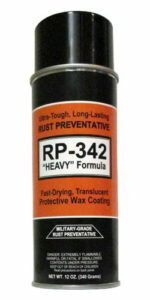 Cosmoline is the strongest, thickest, longest lasting and fastest drying rust preventive aerosol product available. 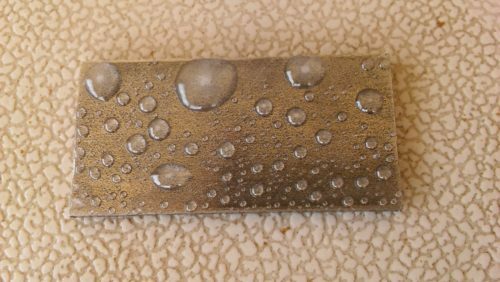 One coat protects all metals, iron, steel, aluminum (stored indoors or outdoors) for years. It produces a dry-to-the-touch, amber translucent (see-through) wax coating. Cosmoline withstands severe outdoor exposure, salt-laden atmospheres, acid & caustic fumes and other damaging environments. It will not crack, craze, peel or flake and remains slightly flexible over time. Cosmoline was chosen by the US military as THE corrosion protectant to use on all metal equipment that was to be stored or transported. If the US military thinks it’s the best solution for corrosion prevention then I’m sure it will work for your small arms too.